Annie's first day in her own clothes! Hello all friends of Annie - let me introduce you to another of her friends: Pam-from-Cobram. I arrived late Sunday keen to read of Annies Blog updates from Laurie(as I'm computer challenged). Monday saw Annie bright and chirpy, with a real sparkle in her eyes and rosy cheeks, how wonderful to see her infectious smile beaming again. 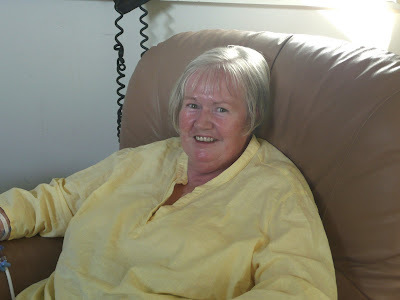 We enjoyed a lengthy chat over a cuppa in her private room in the medical ward -- T H E N -- with great delight and anticipation we packed up all her belongings as she moved into her very own "Independent Living Unit" in the Rehab ward. Its like a huge hotel suite, large bathroom one end then lounge chairs, next her bed and side table, opposite which is an external glass west wall door opening out to a lovely enclosed lawned court with native shrubs and yummy warm sunshine. At the other end of Annies room is a fully equipped kitchen - table, chairs, kettle, fridge, pots, pans the whole lot. Tuesday was her first day in rehab. She showered, washed her hair and for the first time since becoming ill (just short of 6 months ago) SHE DRESSED IN HER OWN CLOTHES and couldn't have been happier. She looked 1000 times better -- even the huge improvement from Monday was enormous.